"Welcome aboard the Disneyland Monorail! For your safety, please remain seated, keeping your hands, arms, feet, and legs inside the cabin. Watch your children—and no smoking, please." As I mentioned in last week's column, June 14, 1959 was the official dedication of the Disneyland Monorail 60 years ago. That afternoon, there was a parade down Main Street U.S.A. that started at 1:30 p.m. with a float depicting futuristic domed buildings with a miniature operating monorail running through the display that television host Art Linkletter called "an actual working model." Roughly around 4 p.m., shortly after the dedication of the Submarine Voyage, the Disneyland-Alweg Monorail system was dedicated by Vice-President Richard M. Nixon, Mrs. Nixon and their two daughters Tricia and Julie. The Monorail, as designed by Bob Gurr, was tentatively called the Viewliner. Richard Nixon: "Thank you very much, Walt. I want to say this has really been one of the most exciting and interesting days that I've ever had in my life and I'm sure that's true of all the others who are here at Disneyland to participate in these various ceremonies opening these wonderful new exhibits which we have here. "Now, I can tell you, however, that is not just the case with regard to young people all over the country but it's true of the dignitaries who come to Washington from other lands. I remember President Sukarno [of Indonesia] also wanted to come to Disneyland and he has been here as you know. "The king of Belgium, the king of Morocco…from all over the world people whether they are adults or children want to come to Disneyland…to see America, the past, the present and the future and so consequently, I just want to take this opportunity to say what a fine job we think Disneyland has been doing in letting all of us for a brief few hours have an interlude in our rather busy life and participate in a feeling about the traditions, the dreams, the hopes of this great country of ours. "Now, of course, comes the time for the dedication although you and I, the adults up here, are probably just as interested in riding this as the children. Since this first monorail system is a system for the future and since Disneyland is a place which children love above everything else, I think it would be nice if our two daughters, Patricia and Julie, cut the ribbon." In later years, Julie Nixon recalled she was a little scared riding the Monorail and looking out over the park but that it was still a thrill. The girls did not cut the ribbon for the early morning photo opportunity. For the filmed dedication, they were given oversized wooden scissors that seemed more ornamental for a good photo opportunity than functional. They struggled at trying to cut the ribbon that wouldn't split and a laughing Walt stepped in and with his hands tore it in half. The Nixon daughters did not remember Walt being upset in any way and, in fact, he recognized that the flub was a good comical theatrical moment and had it included in the featurette Gala Day at Disneyland, when he could easily have edited it out. As Walt suspected it was that moment, that even today, most people remember about the dedication ceremony. According to the official Disneyland itinerary: "Following the dedication, (the Nixons) will be returned to (Walt's) apartment and the Vice President will be free to conduct any meetings that will be necessary, utilizing the office located adjacent to the patio of Walt Disney's apartment. Press and guests were allowed to ride both the Submarine Voyage and the Monorail beginning at 4:30 p.m. From 5:30-7:30 p.m., there was an "Informal Buffet Dinner and Entertainment in Holidayland." Disneyland trains departed from Fantasyland Station at five-minute intervals beginning at 5:30 p.m. and dropped guests off at the Frontierland Station, so they could cross the tracks into Holidayland. After the 6:15 p.m. fireworks display, Walt accompanied the Nixons to the buffet in Holidayland. Nixon and his family then went to Knott's Berry Farm for a family reunion and received special attention from owner Walter Knott. Julie Nixon remembered that Knott's was nice, but that nothing could compare with Disneyland. Later that night the Monorail did break down again, but was up and running the next day when the attraction was first opened to the general public. Like the Disneyland Railroad, the Monorail was owned and operated by Walt's personal company, Retlaw ("Walter" spelled backwards). As a legal concession to Alweg, for several years the monorails were boldly identified as the Disneyland-Alweg Monorail System until 1976, even though they were being sponsored like the railroad by the Santa Fe. There had only been three people from Alweg involved in helping with the Monorail, but most people thought that the company had built the entire system. Alweg Chief Designer Conrad Deller worked with Gurr, and two other Alweg employees worked with Disneyland's Chief Structural Engineer John Wise on the beam way. Gurr has mentioned many times that he was appreciative of the expertise of Deller. For Alweg, the publicity served as a double-edged sword. On the one hand, it received publicity and accolades for the monorail system at Disneyland. On the other hand, critics used it as an example that the system was only good for "kiddie amusement parks," and not as a serious alternative to transportation. In October 1958, Bob Gurr's first drawing of the design for the Disneyland Monorail, then tentatively called "Monorail Viewliner," was submitted. 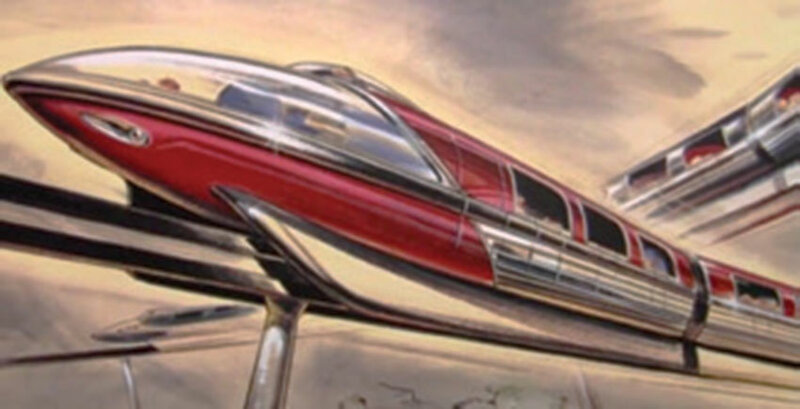 The Viewliner, designed by Gurr, was a futuristic looking train made from car parts, but ran on railroad wheels that ran from a Tomorrowland station to a Fantasyland station from June 1957 to September 1958 and the design of its cars helped inspire the ones for the Disney Monorail. The original Alweg design was more of a rectangular box (Gurr always describes it as looking like a "loaf of bread") with a slit underneath. Gurr came up with a more elaborate exterior design as well as some mechanical design changes that immediately displeased the Alweg people. As Gurr recalled, "The German engineers were extremely upset that Americans who were not engineers and had no experience with monorails should have the arrogance to show up with their own design. At the meeting was a subcontractor from a car building company in Mannheim who thought he had it all wrapped up that they would build the Disney trains. There was a week's worth of heated discussions and at the end we had agreed that we would proceed with my design without their technology. Disney would build the cars in California." With less than a year to build the Monorail system, it was agreed that it made more sense to do so in California that would save precious time from shipping it over from Germany. The job of building the Monorail was originally assigned to the Standard Carriage Works of East Los Angeles, but, in late 1958, Walt Disney, pressured for time, moved it to his Burbank studios where the two Monorails were built on soundstages that had previously been used for the live-action feature film 20,000 Leagues Under the Sea. The Standard Carriage Works specialized in building garbage trucks and was located right next to an old rendering track. Once they started slipping behind schedule with the vehicles, perhaps not being ready in time for the pre-set dedication ceremonies, Walt brought it all in house. Teams at the Disney Studio worked night and day, seven days a week to meet the deadline. To avoid distractions, the area was roped off and even Walt respected that boundary and did not cross over despite his curiosity. As Gurr recalled: "The Alweg version looked like a loaf of bread. I made it sleek and graceful, like a Buck Rogers rocket ship I remembered seeing from when I was younger. I figured I could distract people from looking at the rail and hide the wheels by making it look like that kind of a spaceship with the point in the back and a sled runner in the front. "It hides the fact that it's an ugly rectangle shape and since it looks like those 1939 arrow-shaped cylinder rocket ships, it seems futuristic," he said. "Walt liked it immediately. I had made the body pointed which was a very un-German approach. I did the original drawing in about one hour in my North Hollywood home on my kitchen table. I hear from adults all the time about when they first saw it or when they first rode it. It was truly like the world of tomorrow with this sleek vehicle zipping along that beam high in the air with the sky behind it." The first Monorail vehicles were known as Mark I models. They had two separate cars (red and blue because those were the colors of the two previous Viewliner trains) followed by three cabins. Each car could carry 82 passengers who had to surrender an "E Ticket" to ride. The monorail circled Tomorrowland along eight-tenths of a mile of elevated track higher than the surrounding berm and climbing to a height of 31 feet near the Autopia. Guests could see the still remaining orange groves and vegetable farms outside the park. Each front car had a bubble-like windshield to provide a panoramic view. They also featured a bubble dome for the driver since Walt did not want guests looking at the back of the neck of the driver. The bubble dome had been inspired by the Boeing B47 Bomber. Disney saved money because the chief electrical engineer at the Disney studios was able to get some inexpensive used Westinghouse DC motors, the same kind Disney was using for its film cameras. The driver simply needed to push the power arm forward to go and pull it back to stop. The vehicles were equipped with automatic air brakes. There were various "speed zones" around the track from 18 to 43 miles per hour, although, in general, drivers tried to hold the speed to an average of 20 mph in the park and 35 in the parking lot area. Ironically, that made the monorail the fastest vehicle in the parking lot. The monorail is capable of speeds up to 70 miles per hour. The beam way is about 20 inches wide and 35 inches in depth. Imagineer Bill Martin laid out the track configuration that was similar to the one for the Viewliner. Imagineer Roger Broggie remembered, "It was a delicate balancing act because the engineers wanted it to go in a straight line with no grades because it would operate with fewer problems. The Disney art directors wanted it to have twists and tight turns and climb maximum grades so that it would be a better show for the guests. It is no surprise that Walt agreed." The rubber tires on the vehicles are about the same size as on a family minivan. The tires are arranged in pairs at the front and back of each car, and follow the top of the beam. They are guided by another set of smaller tires which ride along each side of the track, one at the top and one at the bottom. The purpose of these tires is to keep the train upright through the use of heavy springs that hold the tires tight against the beam. Otherwise, the vehicle would have the tendency to lean. A series of direct current electric motors power the train, picking up 600 volts through a pair of "bus bars" running along the side of the track. On June 1961, the beam was expanded so the Monorail could leave Disneyland Park and stop at the Disneyland Hotel, now making it the first permanent operating Monorail transportation system, rather than just a sight-seeing attraction, in the Western hemisphere. It was the first operating Monorail to cross a public street. The beam was extended into the 2.5 mile "highway in the sky" that Disneyland still uses today at a cost of $1.9 million (or roughly a half-million dollars more than the total cost of the original system). That year also saw the introduction of the Disneyland Monorail Mark II models that featured four cars to try to better accommodate the demand, as well as the addition of a new yellow car version called Monorail Gold. In a letter dated May 12, 1961, Walt invited the Nixon family to return for the dedication of the new extension. "Almost two years ago, Julie and Tricia dedicated our first Monorail Trains at Disneyland. Since that time, these trains have traveled 54,013 miles and carried more than 4,500,000 passengers. For this summer, our Monorail system has been greatly expanded to more than two and a half miles from inside the Park all the way over to the Disneyland Hotel and return. We even have a new station at the Hotel. "I thought that you and your family might enjoy being our honored guests for the day, which is Sunday, June 11th and inasmuch as your young ladies dedicated the original system, it would be appropriate for them to dedicate the new extension. I can even assure you that the scissors will be sharp this time!" Unfortunately, Richard Nixon sent his regrets that he wouldn't be able to be there at that time. However, over the years the Nixon family visited the park several times. Although the monorail built in 1961 for the Seattle World's Fair was constructed by Alweg, as well, Disney was not involved in the project. The design and construction were entirely by Alweg. Today, Disneyland operates a fleet of three Mark VII Monorails. Monorail Red and Monorail Blue began service in 2008. Monorail Orange joined in 2009. They were designed to be reminiscent of the original 1959 version but without the bubble top for the driver and the back fins. Each of the five cabins hold twenty-two people. They were built by Dynamic Structures. The route and views are also much different from the original version, including the addition of a Downtown Disney station in place of the Disneyland Hotel one. "Please remain seated until the monorail comes to a complete stop. Then collect your belongings, watch your head, and step carefully from the train. On behalf of all of our crew, thanks for traveling with us, and we hope you have a happy and memorable visit here at Disneyland."